Giving thanks for Lily's "firsts"
The past several weeks have been filled with a lot of first moments for Lily. 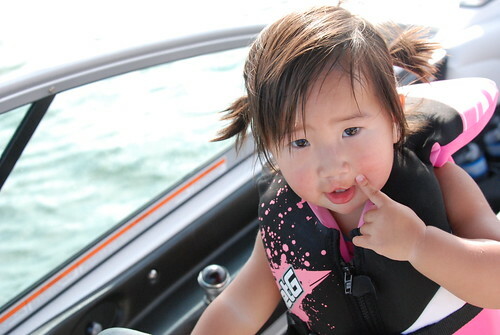 She went on her first tube ride behind the boat and loved every minute of it! She kept signing "like" and "more". Spencer was not thrilled with the slow speed but for Lily...it was perfection! 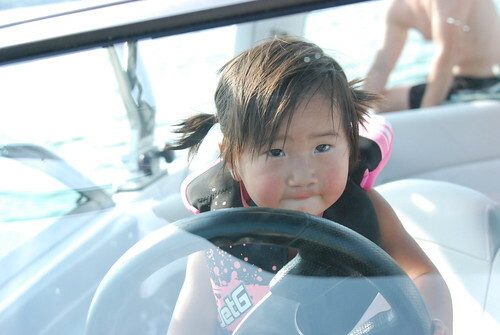 Future boat captain in training! Lily went to the nursery at church for the first time. We made a quick departure and Michael told me not to look back. I didn't... even though I wanted really wanted to. This week I looked back and I think he is right...it's just better on everyone if you keep moving on. 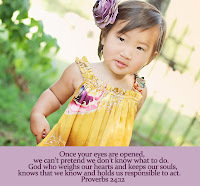 I am thankful that she trusts us and feels secure enough to go to others. We also took her to our small group bible study for the first time and she stayed with all the big kids for almost 2 hours while we were meeting as a group. I love her flexible personality and ability to adapt to new situations with ease. 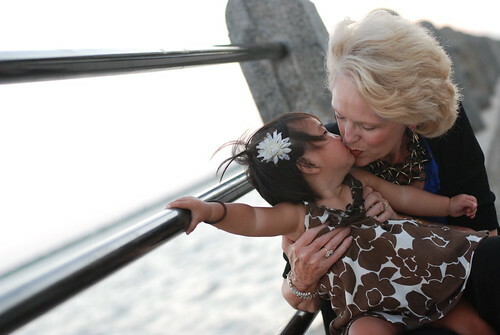 Lily now has 4 speech therapy sessions under her belt. She qualified to receive speech therapy through a research program at Vanderbilt that focuses on early intervention for children with cleft lip and palate...just another way we see God's hand at work in her life. A friend of mine told me about the research grant prior to our trip to China. 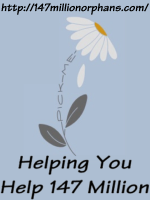 Once children qualify for services they go into a "random" selection to either receive free services at Vanderbilt or community services for which parents are responsible to pay. Both groups receive follow up testing and evaluation to monitor progress. I love that God isn't "random" and I am so thankful that she is able to receive her therapy at Vanderbilt. 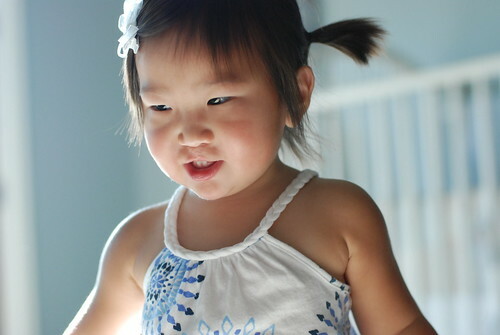 She walked right into the playroom the first day and waved goodbye to me and started to shut the door. She loves her therapist and I get to look in through a two-way mirror to see what she is learning so we can reinforce it at home. She has also started saying dada which makes Michael melt! It won't be long before this girl will be talking non-stop. 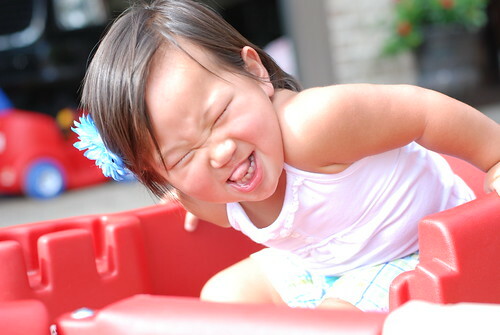 Lily loves playing in her red wagon that her Aunt Lizzy, Uncle Mark and cousin Zack gave her after her palate surgery. 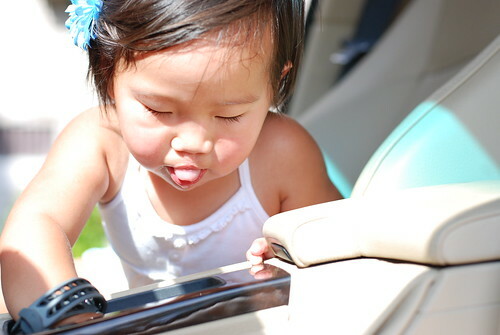 She was content with this until she saw Michael washing the car...pretty soon he had a "helper" join in on the fun. She decided to explore the inside while he washed off the dirt. 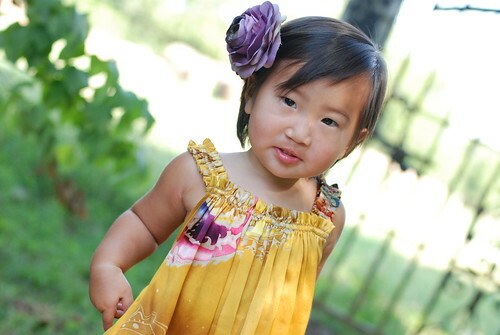 God continues to amaze us with His provision for Lily. She is thriving in every way and we are so blessed. It's hard to believe that we will be celebrating 6 months from the day we first met her in just a few weeks. 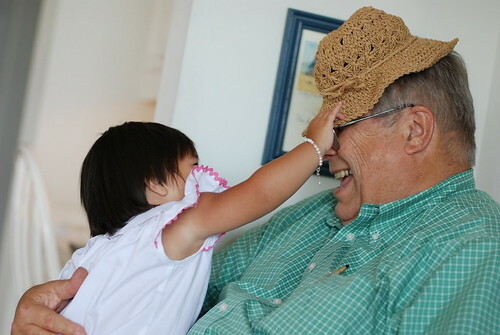 It seems like she has been part of our family forever...she is the missing piece that has filled our home with much laughter and joy. 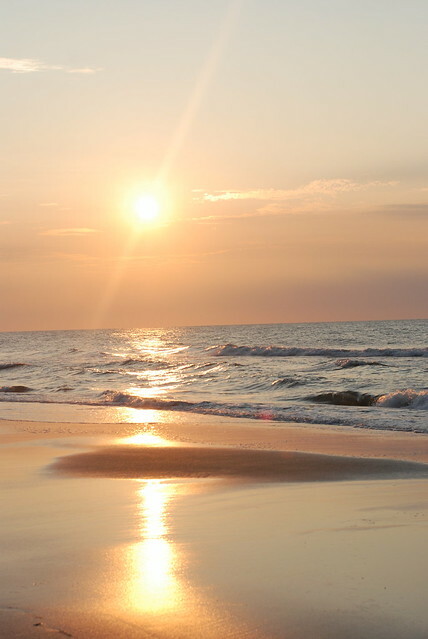 I have not been a faithful blogger lately...please forgive my silence :) Maybe the extra videos and pictures in this post will make up for my 3 week sabbatical! 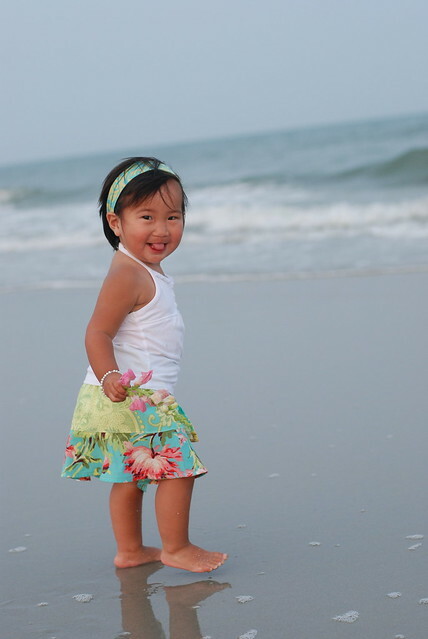 Lily got her first taste of the beach about three weeks ago when she and I went to visit my parents. 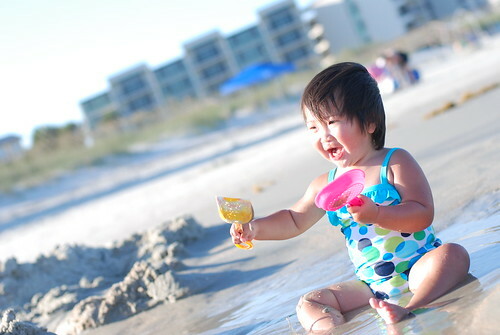 We took her out to the beach around 5 pm the first night we arrived and she was mesmerized for the next several hours. 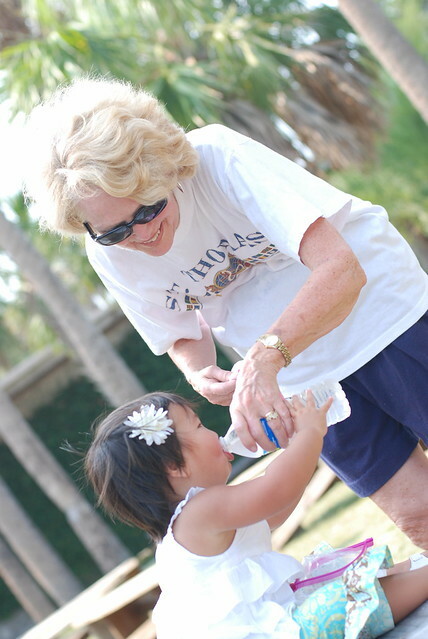 Here are some of her first experiences with the sand and water having fun with her "gaga" and "papaw"! Lily and Gaga building a drip castle together...it brought back fun memories of doing this with my mom when I was little. After Lily explored in the sand we look her down to the water. Needless to say...she loved it! Soon there was a tide pool that formed which was a perfect spot for Lily to play with all the toys Gaga and Papaw bought her for the beach. This is one of my favorite pictures...Lily was about to give Gaga one of her famous sloppy kisses. 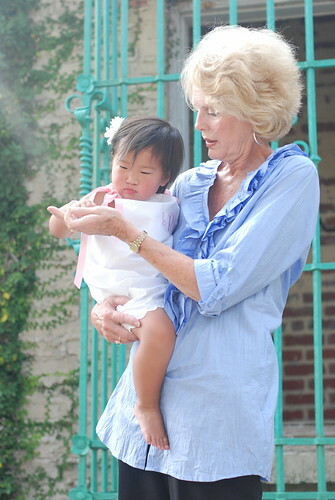 Love the way she is looking up at my mom...pure love. My parents thought of everything...they had beach toys and a fun wagon for Lily to ride in to the beach! It was a perfect spot for toting all our gear...I'm not sure why we never thought of having one of these prior to grand kids! My mom should get some kickbacks from Costco for all the people who wanted to know where they could buy one for their family. 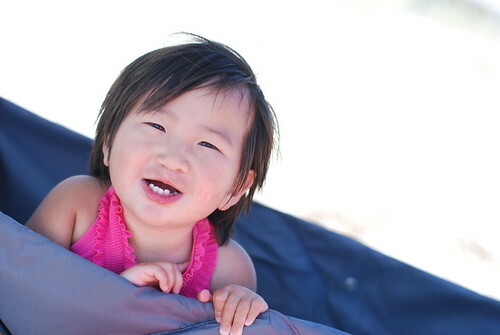 Here she is having fun in her wagon after one of our photo shoots on the beach. 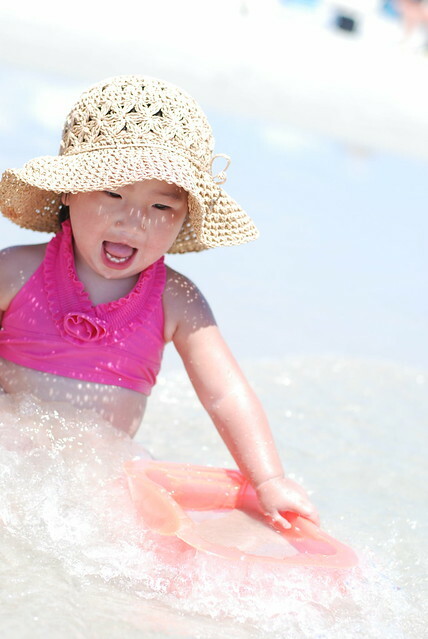 She went swimming in her dress in a little "beach pool" with some friends we met who also had a little girl from China. 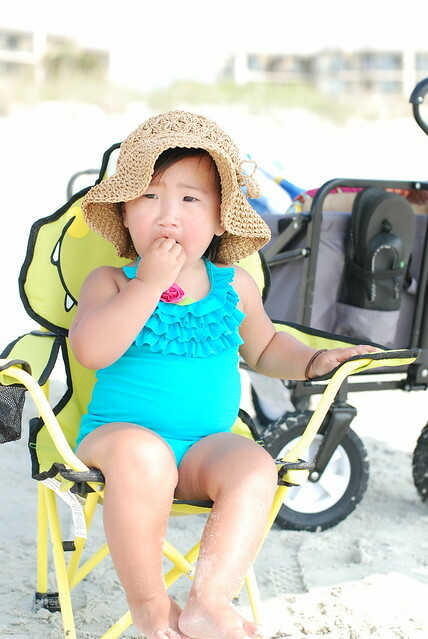 They even bought Lily her own little alligator chair for the beach…she loved eating her lunch and snacks in her “big girl” chair. They bought Lily her own "computer" which has been a great source of entertainment for her and laughter for all of us, especially when she gets fixated on the same button over and over (kangaroo...kangaroo...kangaroo!). 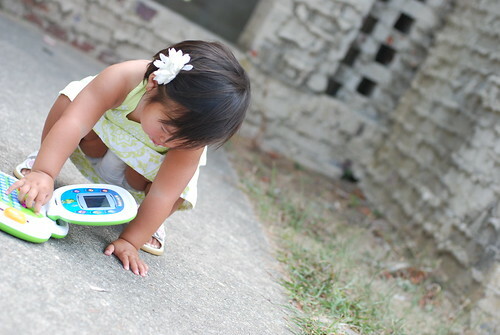 I love Lily's spirit of adventure and exploration...each day she wanted to go further into the water. 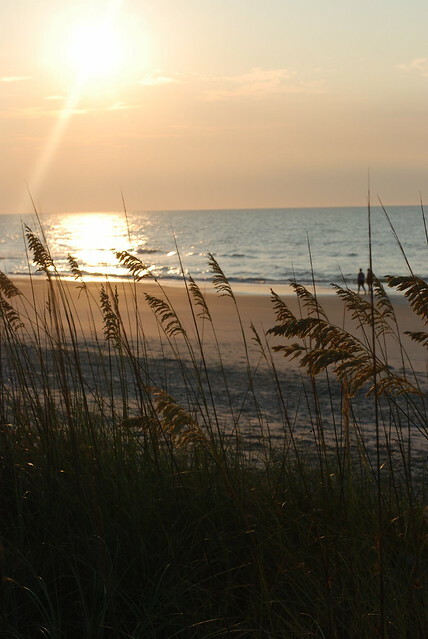 What a gift it was to see the beach through her eyes. 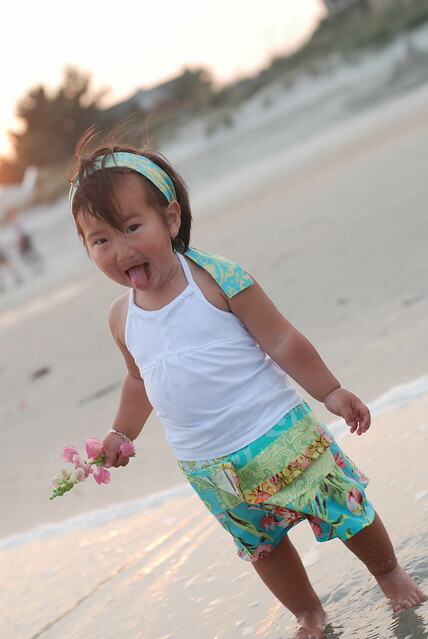 The first day on the beach we met a family who had 3 girls...two were adopted from Guatemala and one from China. 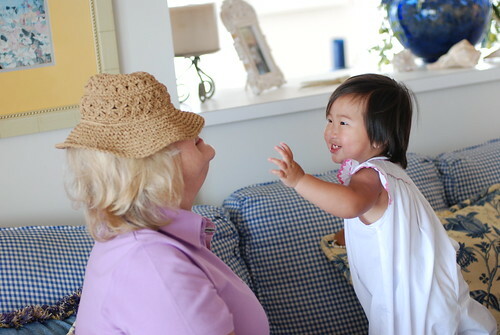 When Lily saw their little girl from China she immediately lit up and wanted to play with her. She also had a cleft lip...maybe another reason she felt an instant connection to her. My Mom invited a group of her friends over for a “meet and greet” to see Lily while we were there. 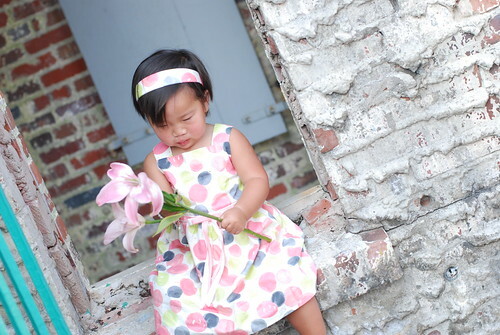 I am so grateful their group of friends who have prayed for Lily throughout our adoption journey. Right before everyone arrived Lily decided to have a nice little crying fit on the floor…a combination of being tired and hungry! 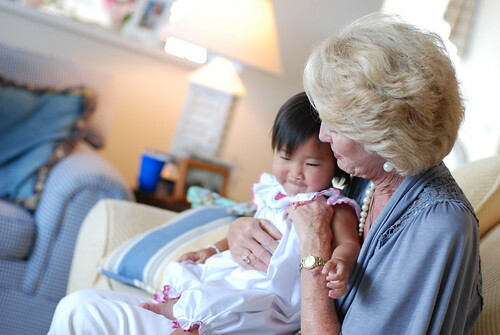 Fortunately when the first guest arrived she pulled herself together and was a happy little girl again. As I was visiting with everyone I noticed that she was walking around to everyone’s lap and eating off their plate! 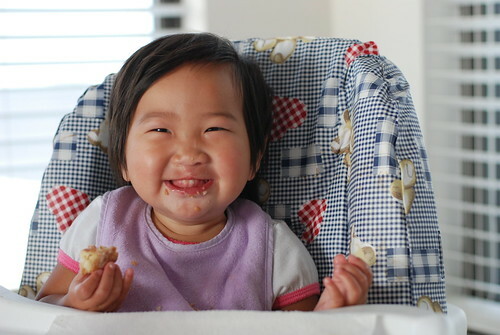 It dawned on me that I never finished feeding her lunch...our little resourceful girl. She loved all of the attention and put on quite a show making everyone laugh. She was completely at ease with over 25 new people she had never seen..I am in awe of her social personality. Lily loving on her Gaga as if to say thank you for my day of fun! It was a beautiful week and the weather was perfect. 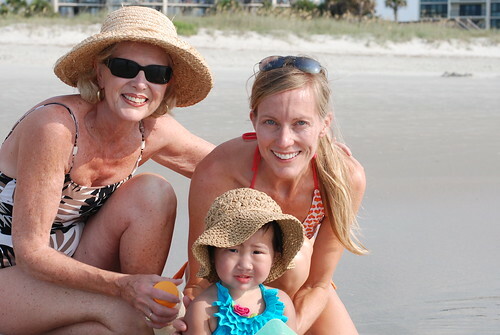 My dad was the official "babysitter" so I could go out on the beach with my mom while Lily napped. 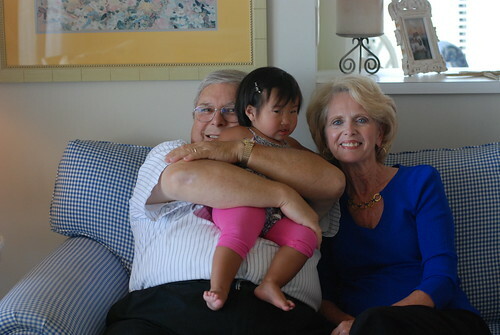 It was such a treat to be with my parents for a week and watch them love on Lily (and be so good to me too!). It was a week filled with great memories and lots of fun...the only thing missing was Michael and Spencer. 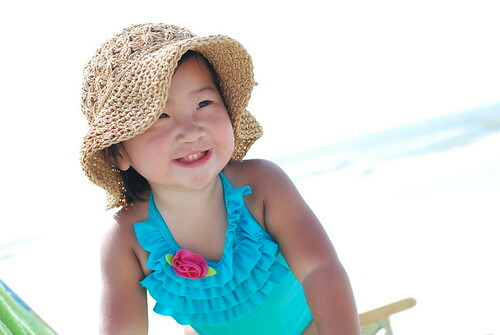 Lily loved it so much that she cried more the two days after coming home than the entire week we were at the beach! Hummm...could it be she was missing all the added attention she received??? 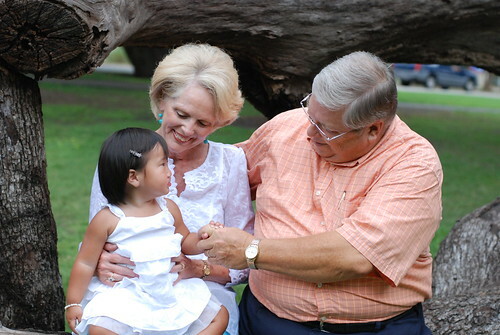 My parents even endured a very hot, muggy morning going with me to take pictures of Lily at an old castle nearby. If you know my dad...this is a huge sacrifice because he does not do muggy! 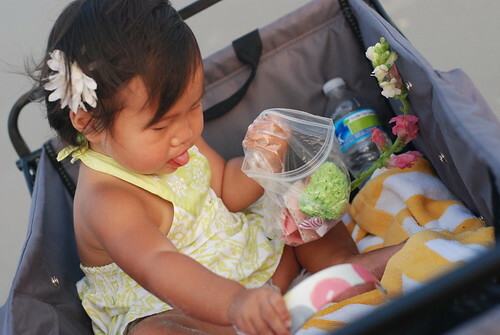 I got a few good shots but the heat made all of us pretty miserable...especially Lily. Resorting to bribery with some snacks...still not doing the trick to bring many smiles! My mom said she didn't blame her...three change of outfits + unbearable heat= one unhappy little girl. We even went back that afternoon to try and get some better pictures but again...not much success. I'll probably get written out of the will for showing this one of my mom...she was so hot she actually wore shorts for the first time all summer! I finally got a few fun pictures one night when my parents were at church. 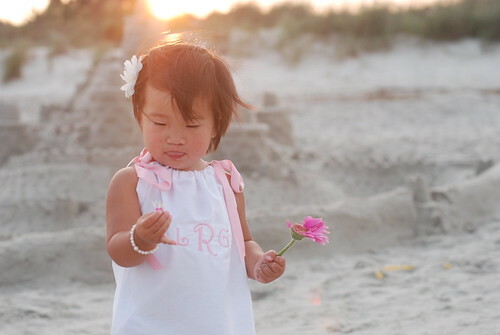 I loaded Lily up in her wagon and headed to the beach at sunset. The morning we left God painted a beautiful sunrise so I captured a few shots while Lily was still sleeping...a perfect end to a week filled with great memories. I am so grateful for the love of family...thank you Mom and Dad for sharing your home and treating us to a wonderful week!